Potatoes ( Solanum tuberosum) come in a myriad shapes, sizes and colors, with different starch and moisture content that makes different kinds suitable for different cooking methods. 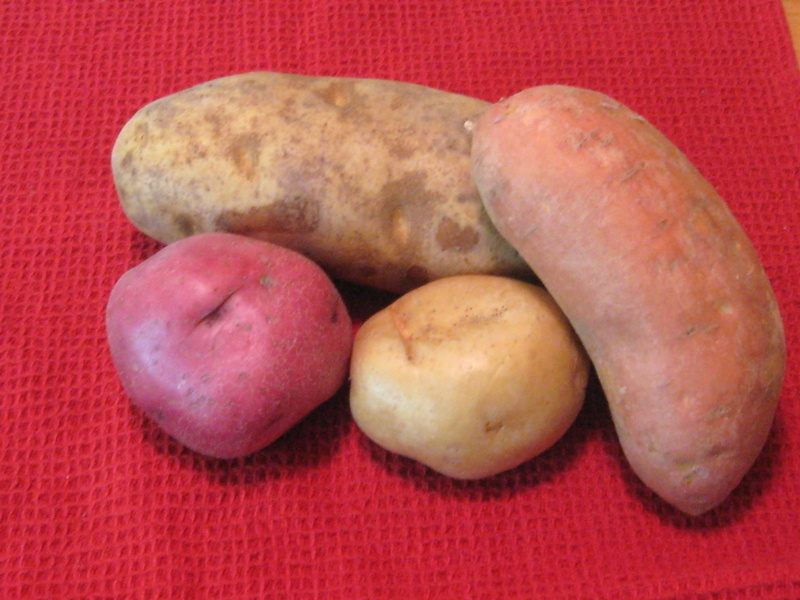 There are red potatoes, white potatoes, purple potatoes, yellow potatoes, fingerling potatoes…. (I’ve put in the botanical name because these are different from sweet potatoes (even though we call both potatoes). They are a wonderful vegetable–nutritious with lots of minerals and vitamins. I think they sometimes get a bad rap for all of the things we pile on–for example–a baked potato. With “the works” added it’s certainly not low calorie…but we’re responsible for all that extra stuff that adds calories and “bad” fat. There are lots of good things to do with potatoes that are quite healthy and then at times, potatoes turn into luxurious comfort food. All potatoes are created delicious, but not necessarily equal when it comes to performance. You need to pick the right potato for what you want to do: russet potatoes will be mushy in a potato salad. Red potatoes (frequently called “new” potatoes–even though they are not) may not make the most luscious, decadent mashed potatoes. First, about what should and should not be called a “new potato“: only a potato that is harvested while immature is “new”–you can tell by looking at the skin. On real “new” potatoes (all sizes) the skin is very thin and can be rubbed off the tuber; you will likely see places where it has been abraded. Size does not tell you if a potato is new or not! Even some very reputable and otherwise knowledgeable authors use “new potato” to mean red potatoes or boiling potatoes. 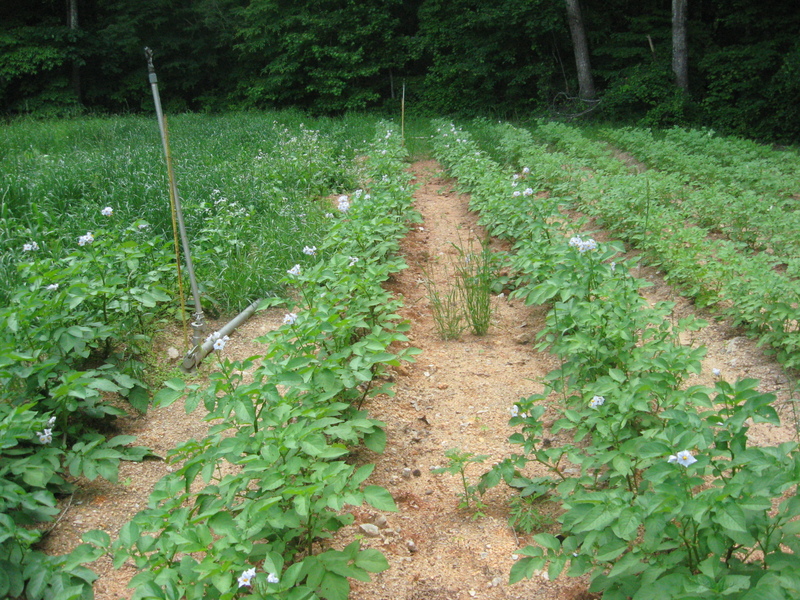 Newly harvested potatoes differ in moisture, starch and sugar content from potatoes that are fully mature. They are wonderful in their own right if you can get them–it’s one of the joys of growing potatoes. You can go out and get some really new potatoes. 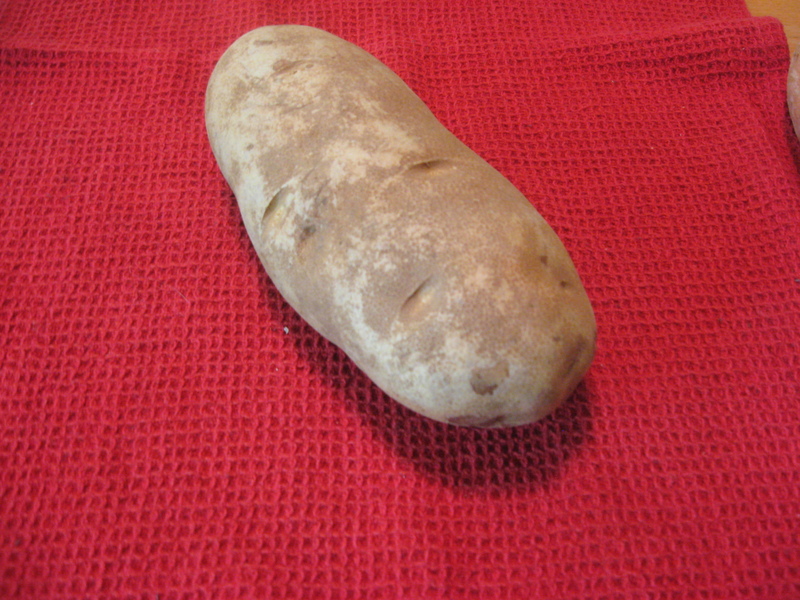 The russet potato is the potato usually recommended for baking and for mashed potatoes. They have lots of starch and less moisture than either red potatoes or Yukon gold potatoes. They will make fluffier mashed potatoes and baked potatoes. They’re my preference for baked and mashed potatoes because I want “fluff” in my baked potato and I want to be able to add lots of butter and cream to my mashed potatoes. 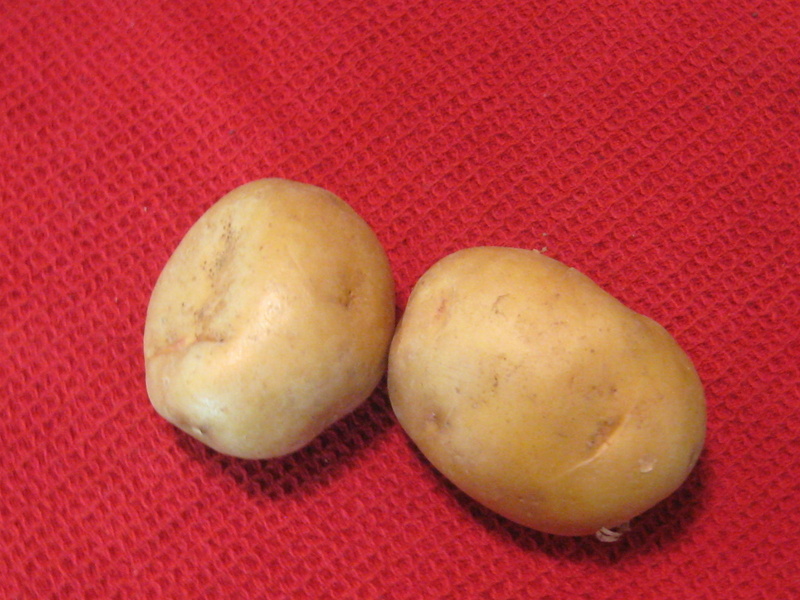 The Yukon gold and Yellow Finn are rather middle-of-the-road potato, with medium starch and medium moisture. 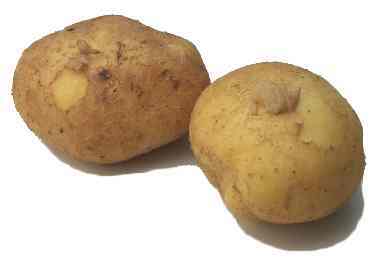 If in doubt, and for an all purpose potato, these are my choice. The flesh is pale yellow and I think a bit more “buttery” flavor than bakers or the red potato or even the round white potato (not pictured here). 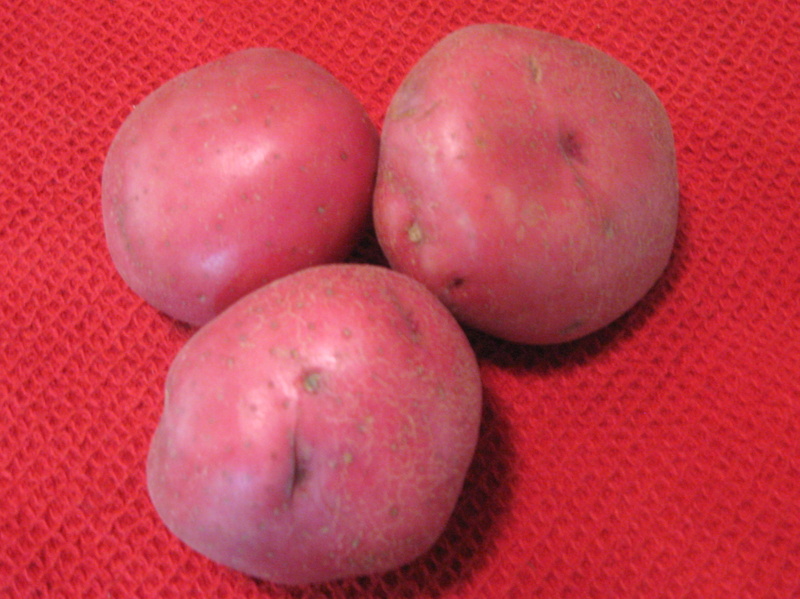 The red-skinned, or red potato (sometimes called “new potatoes” or boiling potatoes) are usually described as “waxy”–that is low starch, higher moisture. These, or round white potatoes, would be my choice for potato salad, roasting, because they hold their shape well. Then there are sweet potatoes (Ipomoea batatas), which are commonly (and incorrectly) called yams. Yams are a totally different biological entity. These are only distantly related to the potatoes discussed above. Sweet potatoes likewise come in a variety of moisture content and colors. The orange-fleshed ones are very moist, and as the name indicates, sweeter than the “real” potatoes described above. They are good baked and as french fries. The white-fleshed ones are drier and those are my favorites for baking and making fries, but they are hard to find as a rule so when I see them, I bring some home. 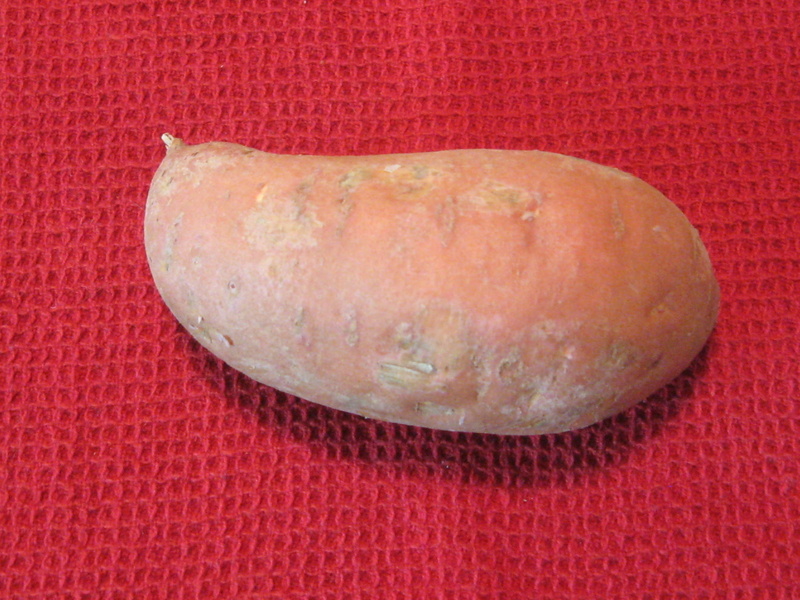 There are purple sweet potatoes, too–again sometimes called yams, which they are not. I’m going to be looking for these–I really like the purple potatoes, so I need to try these–they will certainly give a new look to sweet potato pie! No matter what kind of potato you are buying, there should be not cuts, abrasions, or soft spots. 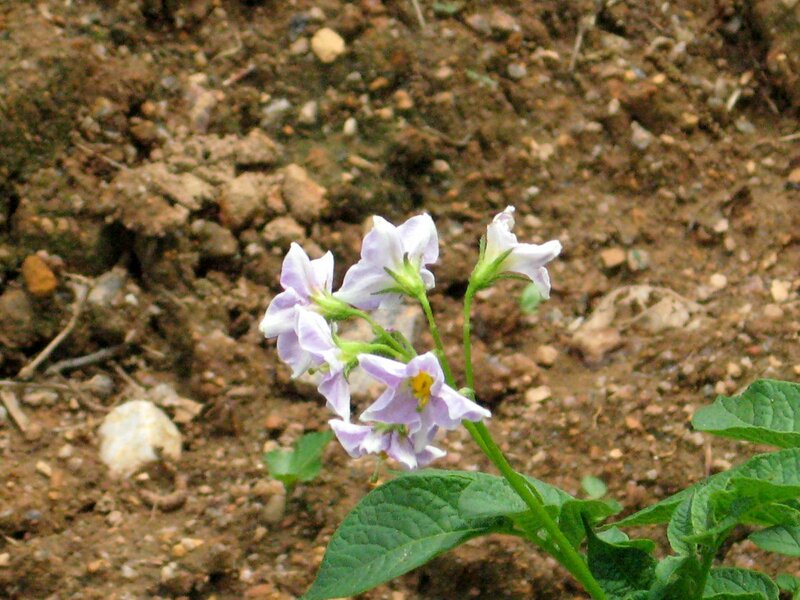 For potatoes (Solanum tuberosum) you should check to see that there is no greenish discoloration. This comes from exposure to light which produces solanine, a natural toxin. The green is actually chlorophyll, but it’s presence indicates the possible presence of a toxin, so green potatoes should be discarded. When you get you potatoes home, they are best stored in a cool, dry, dark place. Best is a temperature of about 40 to 50 ° F. That’s certainly not the temperature of living quarters. When stored at lower temperatures this can cause conversion of the starch in the potato to sugar and that will affect the flavor and cooking characteristics. Lacking a suitably cool, dry and dark place I pass on the five-pound bag of bakers no matter how good the price, and bring home only what I’ll use in a short time (a week or ten days) and store them in the refrigerator (even though I keep my refrigerator really cold) otherwise they sprout before I use them all. For lots more varieties and more suggestions for use see The Cook’s Thesaurus and the Potato and the sweet potato entries in Wikipedia for lots more great information on potatoes. This is by no means a complete discussion of potatoes–I hope it gives you some basic information on different characteristics of potatoes and which are most suitable for what use. In the end, it’s your choice–want fluffy mashed potatoes, go russet; more rustic mashed potatoes–use red or try Yukon golds. After all, you’re the one eating them A son goût! And here’s a bit of trivia for you for you next occasion for small talk: 2008 was the International Year of the Potato. There is nutrition information and other fun stuff.